We have a great offer for you. Now get a $20.00 discount on your next purchase. Hurry!! This offer is only good for today. Here's our Total Price. No Hidden Charges! Don't be fooled about first time customer discounts! Look at their total price, we will be cheaper. Guaranteed! Start your order by picking a color and quantity, then click on the Product Customization Tab below to finish your order. Special Offer: Free Setup, Free Artwork, Free Proof & Free Shipping! To continue, please click on the red customize your item tab below. You have selected 1 quantity for this product. After completing your order you will receive an online order confirmation & artwork proof for final approval. 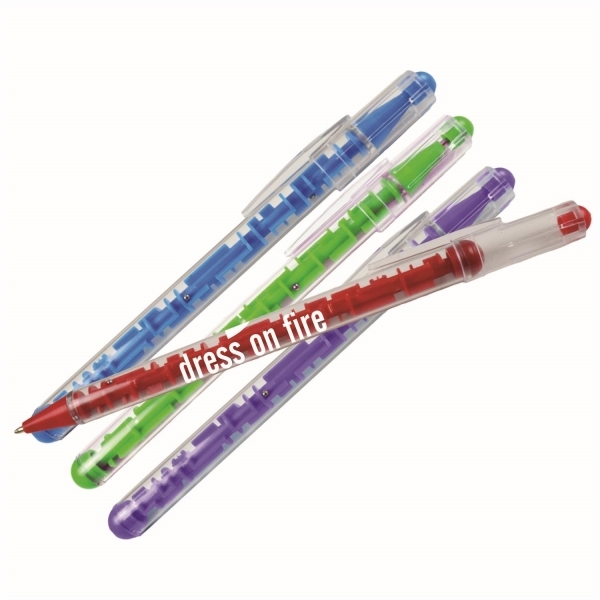 Looking for something that will not only write but also entertain your Customers! Then look no further this is the pen for you! 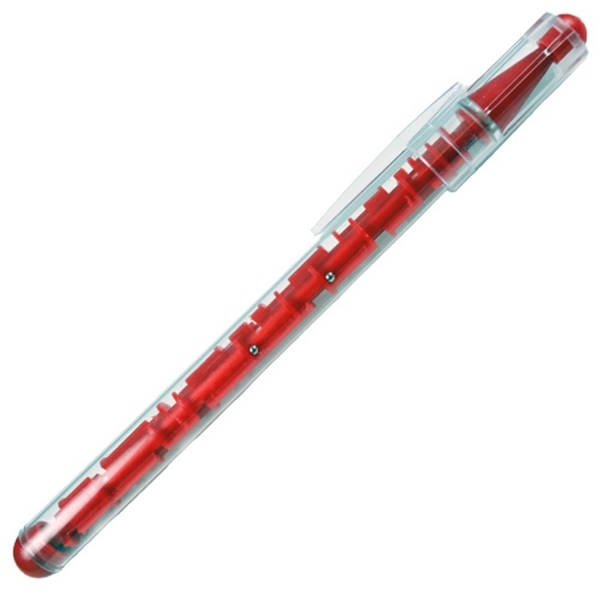 This clear stick pen has a puzzle inside in the middle with 2 metal balls to navigate. This is the perfect pen to help promote your business, wether it be for a school or fundraising event, this pen will surely A-Maze your clients. Customize Your Product: Up to 5 lines of text - 35 characters per line max. Imprint Method: Printed - Price includes one color imprint. Color Ink/Point: Black ink with medium point. Rush Service: Yes, 1 - 3 working days. FREE! Set Up Charge: FREE! Price includes one color imprint. Production Time: 5 business days after art approval. Shipping Weight: 5lbs. per 200 - FREE Shipping! When do you need your order? 1. Select your item color. What color product do you desire? 2. Select your quantity. How many products do you want to buy? After you have made your color and quantity section, click the Product Customization Tab. 3. Select imprint options. What imprint option should be used to imprint your products? 4. Select imprint color. What color ink should be used to imprint your products? 5. Select Font Style. What Style Font should be used to imprint your products? 6. Select Ink Color/Point. What color writing ink should be used for your products? 7. Enter the text for your imprint. What imprint would you like put on your custom products? 8. Special Order Instructions. You have any Special request about your custom products? 9. Date you need your order. Select an in-hands date to expedited order processing. Once you place your order, you will receive an e-mail confirmation with your order number. A Customer Care representative will review your order, confirm the dates and review your artwork. If you need it, we will create print-ready art for FREE! After all of the details are set, we will send you a complete order confirmation along with a FREE e-mail proof of your imprint for final approval. How do I send my artwork? Yes! We are happy to provide two free samples up to $10.00 and ship them free of charge via ups ground. For an actual pre-production pen sample the fee is $20. Free samples will either be blank or have a random imprint or logo, availability permitting. For sample request, Click on the Free Sample tab! Can I have the pens imprinted with two or more colors? What kind of font & color are used for imprinting? Click here to see the font and colors we have available for imprinting your writing instruments. When customizing your item, you can request a different font by entering the font style you want in the (Special Order Instructions field) Your request only, we can customize your text imprint (Larger, Italic, Bold, etc. ); otherwise the imprint will be printed in the standard font and size. How much information can I have printed on the pens? Most of our plastic pens can have 3-4 lines with up to 30 characters per line. Each pen will disclose the maximum number of lines it can have. We imprint our laser engraved metal pens with up to only 2 lines. Can I have less than the minimum quantity shown? Yes. The minimum order is listed for each product under the "Qty" box. Occasionally we can do up to 1/2 the normal minimum with a less than minimum fee. Contact Customercare at 877-706-1866 for availability of this less than minimum option. All orders are shipped out according to the delivery date given after artwork has been approved. If an order is approved and printed quicker than expected, it is possible that order may ship out earlier than originally scheduled. What is the turnaround time on orders? Turnaround time varies for each product. The average production time is 1 to 3 working days after you approve your order. If you have a specific date, please ensure that there is enough time before you opt for a normal production timeline. Please remember that delivery time is the total of both proofing time, production time and shipping time. The normal production time is listed for each product on the Data Sheet. We must have your proof approval prior to proceeding with your order. When do I receive my artwork proof? All proofs are sent within 24 hours after your order has been placed. Once you have received your proof, we recommend approving artwork within one business days after order was placed to ensure your original delivery date. If changes need to be made, please keep them to a minimum as to not delay order process. Can changes be made after I have approved my proof? Once artwork has been approved, it is quickly sent into the production. If changes are absolutely necessary and order has not yet been printed, some exceptions can be made but charges may be applied depending on the time and if the screen has already been made. 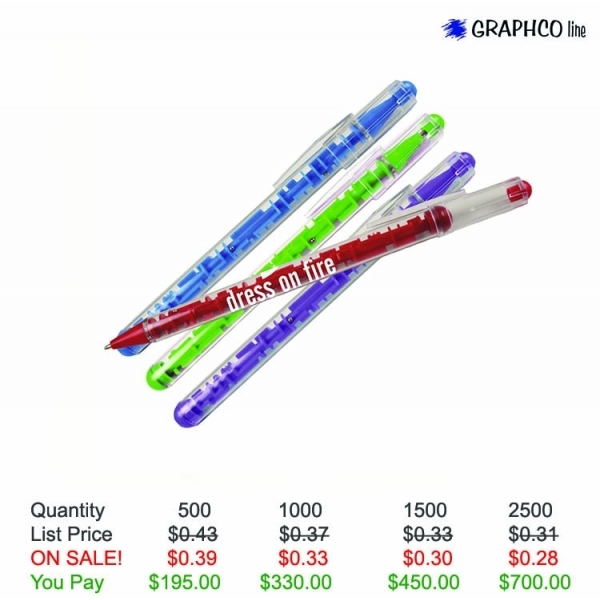 Get additional savings on promotional pens with everyday low prices. These new promotional products will help you stay ahead of the competition. Need More Promotional Products? See Our Sister Sites. © Copyright 2010 - 2019 NeedPens.com. All Rights Reserved.